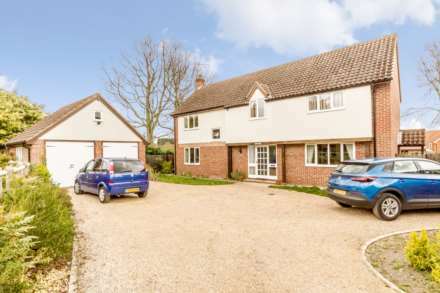 Situated in a secluded location on a private lane, Longsons are delighted to bring to the market this spacious four bedroom detached house in the Norfolk village of Great Dunham. Completed in 2004 the property boasts four double bedrooms, two en suite shower rooms, three reception rooms, kitchen/breakfast room, double garage with spacious office/hobby room above and gardens. Briefly the property offers entrance hall, lounge, dining room, study/office, kitchen/breakfast room, utility room, cloakroom with WC, four double bedrooms, two en suite shower rooms, family bathroom, double garage, office/hobby room above double garage, gardens and oil central heating. Great Dunham is a small Norfolk village with a village hall, church and primary school which feeds into the popular Litcham High School. 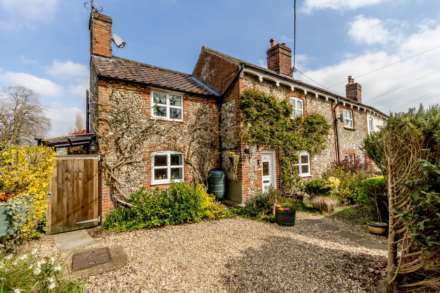 Situated approximately two miles from Litcham with facilities including - village store/post office, fish & chip shop, public house, butchers, doctors surgery and church. Just over 8 miles away lies the market town of Swaffham with all the expected amenities including shops, supermarkets and restaurants. Entrance door to front, stairs to first floor, under stairs storage cupboard. Feature fireplace with brick surround, tiled hearth and tiled mantel, French doors opening to rear garden, double aspect glazing with double glazed windows to front and rear, wood effect laminate to floor, two radiators. Fitted kitchen units to wall and floor, work surface over, stainless steel sink unit with mixer tap and drainer, space for electric oven, space and plumbing for dishwasher, space for large American style fridge.freezer, double glazed window to rear, wood effect laminate to floor, radiator. Entrance door opening to side, oil central heating boiler, space and plumbing for washing machine. Wash basin, WC, obscure glass window to side, radiator. Built in cupboard housing hot water cylinder, built in storage cupboard, window to front, radiator. Walk in wardrobe, two windows to front, wood effect laminate to floor, radiator, door to en-suite shower room. Shower cubicle, wash basin, WC, fully tiled walls, loft access, obscure glass window to side, heated towel radiator. Built in cupboard/wardrobe, window to rear with open views, radiator, door to en-suite shower room. Wash basin set within fitted cabinet, concealed cistern WC, shower cubicle. Double aspect glazing with windows to front and side, radiator. Bath, wash basin, WC, window to rear, radiator. Two electric remote controlled motorised roller main doors to front, access door to side, two windows to rear, electric light and power. Wood effect laminate to floor, two Velux style windows to roof, electric lights and power, would make ideal office/hobby space. Front garden laid to lawn, shrubs and plants to borders, wooden garden shed, access to side/rear garden. Laid to lawn, paved patio seating area, wooden fence and hedge to perimeter.